[March 24, 2017] NEW YORK (Reuters) - Bob Dylan's new album "Triplicate" explores American standards from the 1930s, 40s, and 50s, but the veteran singer-songwriter says that does not mean he is yearning for the past. 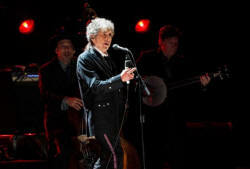 Dylan also is unconcerned whether his fans like the album - the third in as many years that features cover versions of classic songs like "Stormy Weather," "As Time Goes By" and "Stardust." "These songs are some of the most heartbreaking stuff ever put on record and I wanted to do them justice. Now that I have lived them and lived through them I understand them better," Dylan, 75, told music writer Bill Flanagan in a rare interview. "It's not taking a trip down memory lane or longing or yearning for the good old days or fond memories of what's no more," he added in the lengthy Q&A, posted on the bobdylan.com website on Wednesday. The three-disc album "Triplicate" will be released on March 31. It follows 2015's "Shadows in the Night" album of Frank Sinatra covers and 2016's similar "Fallen Angels" in marking a strong contrast from the early, socially-conscious folk and rock compositions for which Dylan remains most famous. Asked what his fans might think of the cover albums, Dylan said; "These songs are meant for the man on the street, the common man, the everyday person. Maybe that is a Bob Dylan fan, maybe not, I don’t know." Dylan also spoke of the loss of fellow musicians like Leonard Cohen, Leon Russell, and Merle Haggard, all of whom died last year. "We were like brothers, we lived on the same street and they all left empty spaces where they used to stand. It's lonesome without them," he said. No mention was made of Dylan's Nobel prize for literature, and his non-attendance at the annual Nobel award ceremony in Sweden. Dylan is due to perform in Sweden next week as part of a European tour.